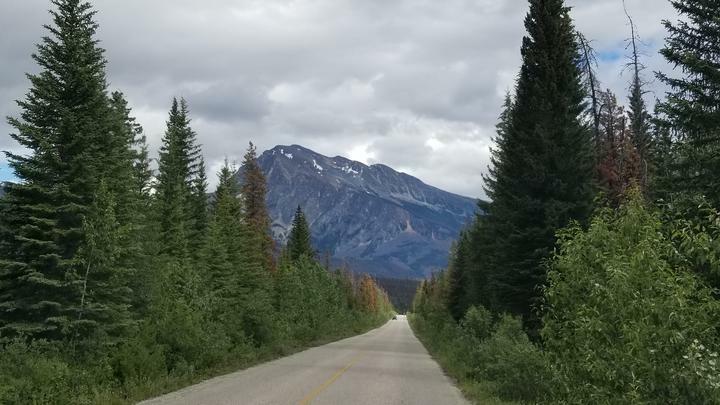 We left Valemount at 10:15am Saturday July 7, drove up CA5 the 13 miles until we headed west on CA16 47 miles through Jasper National Park entrance and to the village of Jasper. It had rained on and off through the night and it was quite gloomy when we left. It started to clear off a bit by the time we crossed over to the province of Alberta and the park entrance. $C39 for a 2 day pass. 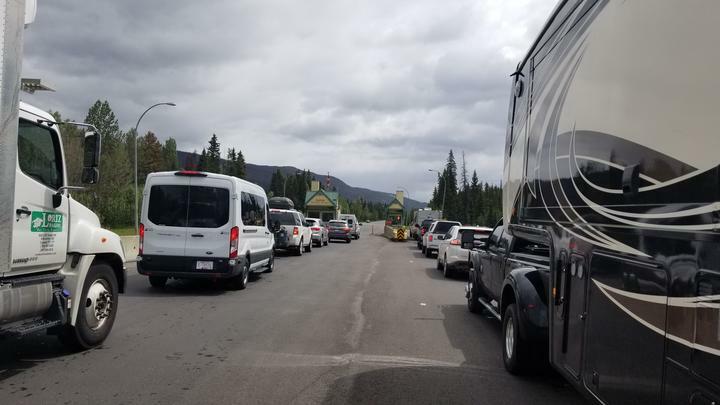 We pulled into the village of Jasper and found it full of RVs and people. 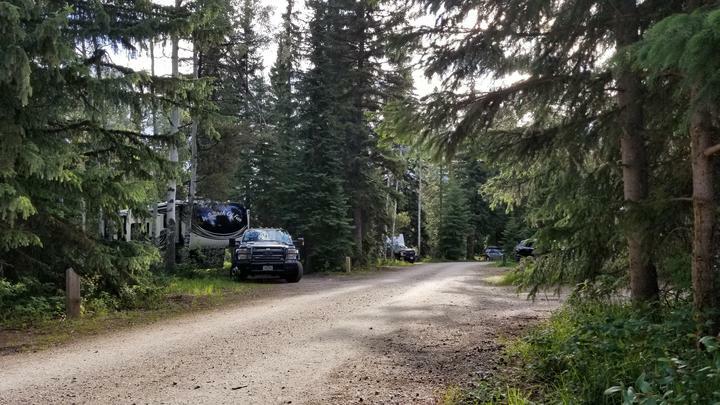 A little uncomfortable pulling our 38′ trailer, so decided to just go down CA93 a couple miles to our camp site at Whistler Campground for the next couple nights. A bit challenging backing into 30GG without tagging a tree, but got set up fine about 2pm (changed to MDT when we crossed the Alberta province border). No hookups and not a lot of sunshine for the solar panels because of all the trees. We do have our Champion 3400 watt generator just in case. After setting up, we drove back to explore Jasper. The day turned out to be quite beautiful. A little cloudy, but still lots of sunshine. Temp was cool, around 64°. What a great town to wander around. 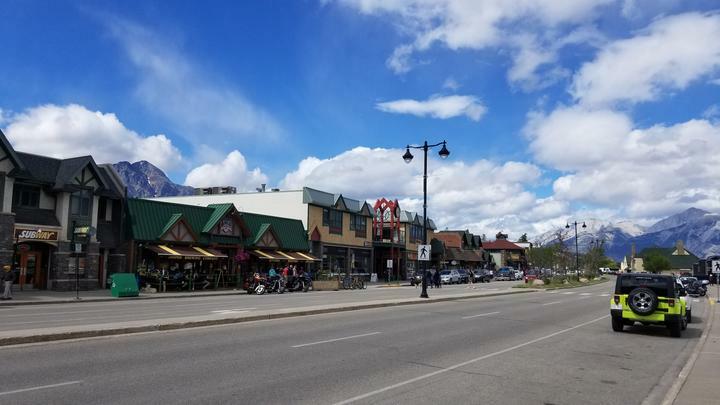 There are lots of shops and restaurants as Jasper is also a winter sports mecca. Found the Jasper Brewery of course. The sleeve (10 oz) of 6060 stout and the bacon burger hit the spot. 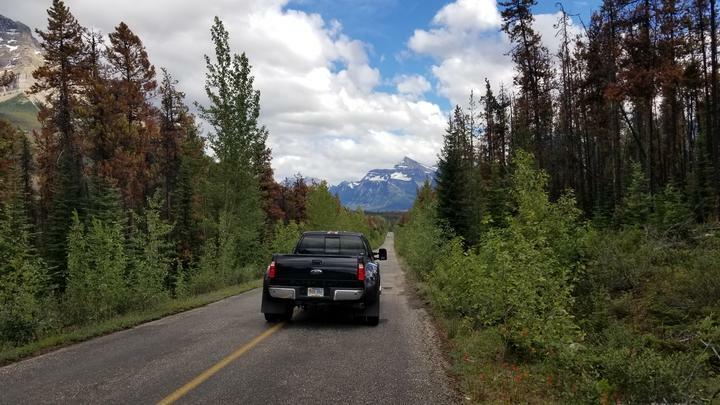 A lot of daylight left, so we ventured south, taking CA93A loop, a less traveled road on the east side of the Athabasca River. Beautiful drive with snow capped mountain peaks around every bend. 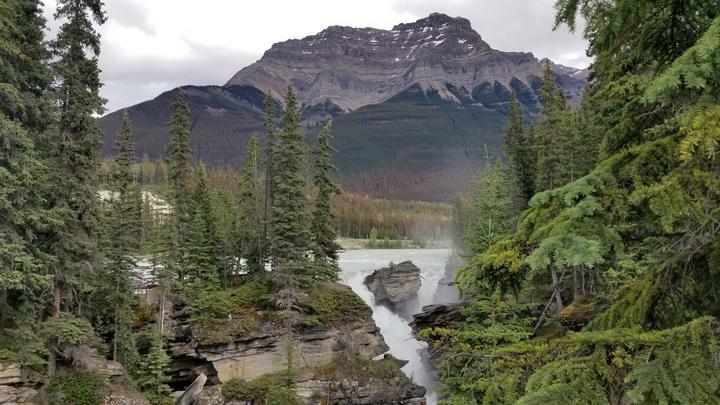 We drove along the Athabasca glacier fed river, lending itself to incredible views of God’s creation. So many mountain peaks it was hard for us to identify them for certainty. Thinking this one must be Mt Edith Cavell (11,033′). 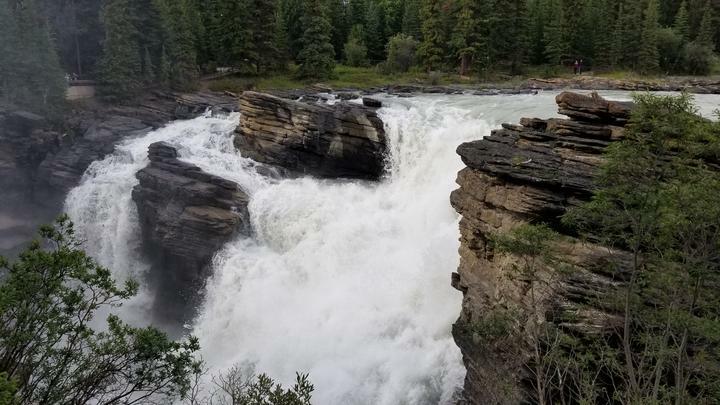 Athabasca Falls is located just before CA93A loop joins back with CA93. 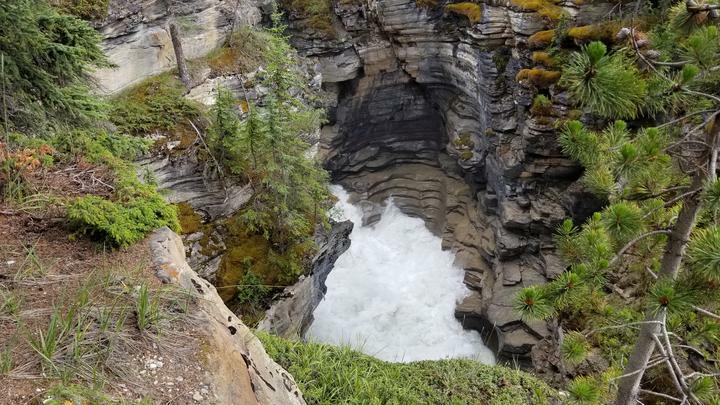 Spectacular views joined with the roaring sound of the water purging through the rocks was absolutely breath taking. The observation area was swarming with other tourists, all appeared as amazed of the beauty as we were. It appeared to us that most people were from other countries. Perhaps Europe, Asia, Middle East, and India. 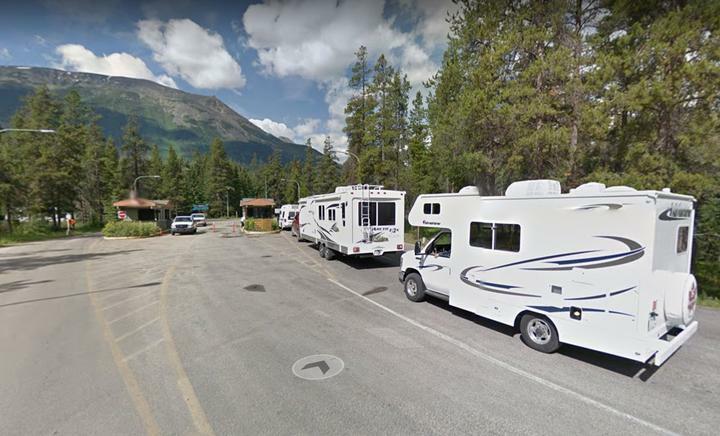 Many rental class C RVs parked in the parking area and along the road. Including Adventurer, CanaDream, CruiseCanada, as well as private RVs. 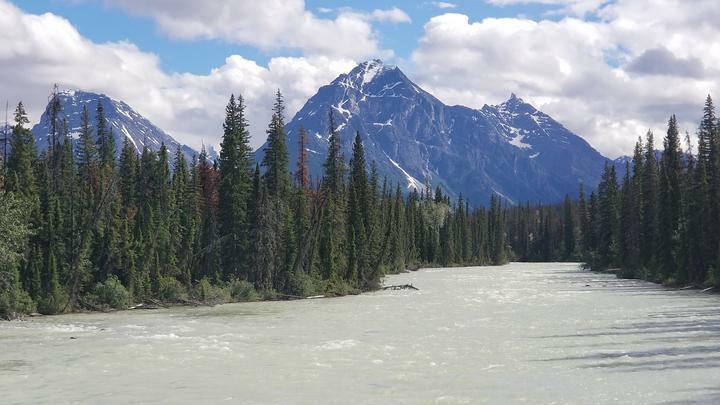 Jasper is a wonderful destination for vacationers. God is good. Please send your name and email address to Ed at the StreamingAround email below. 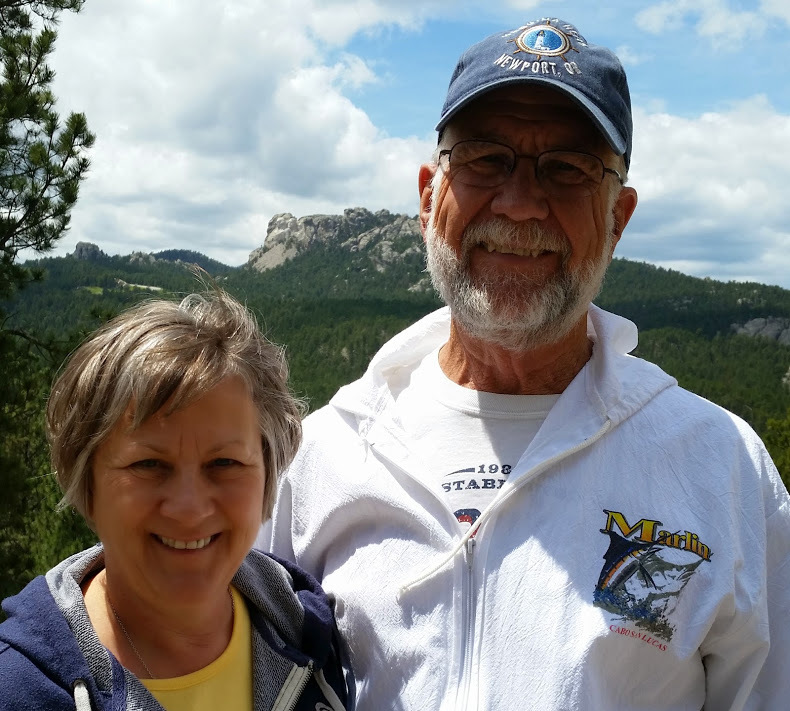 Cliff and Cyndy started this full time adventure just before we did back in 2013. Check out their blog page here. 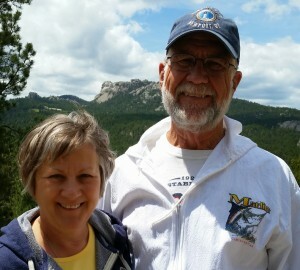 It is fun to meet new folks as we travel, as well as having a free place to overnight. Check out Boondockers Welcome and learn how you can enjoy the adventure too. We recently discovered Harvest Hosts. Click on the link below to check it out.